Lenny got home late yesterday from a long visit with his family. We hadn't expected to spend Valentine's Day together this year so it is a special treat! We plan to watch Olympics figure skating tonight. The pairs skating is my favorite though I usually forget to check the schedule and miss the event. Finally, I'm remembering that it is early in the Olympic schedule. 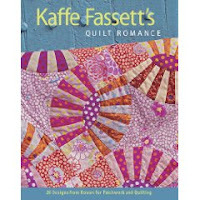 Also yesterday another special treat arrived in the mail, the book I'd ordered, Quilt Romance by Kaffe Fassett. Link to Quilt Romance book at Amazon.com Other quilters may know of his wonderful fabrics but this is my introduction to them. I'm smitten. The bright colors in busy floral patterns, polka dots and stripes are so charming. The setting for all the photos in this book is equally enticing. It is a small village in North Wales that looks like it should be in Italy. This little town is moving to the top of my dream travel list.